We're in a small Derbyshire village — it's 1665, and the Great Plague is about to infect the masses. Written by Matt Hartley and directed by Adele Thomas, Eyam is a new production is based on a very true, if gruesome, story, of reverend William Mompesson. He arrives in his new parish of Eyam just before catastrophe strikes. Suddenly, the village must decide whether or not to selflessly quarantine itself to contain the Black Death and stop it ravaging more of the county. 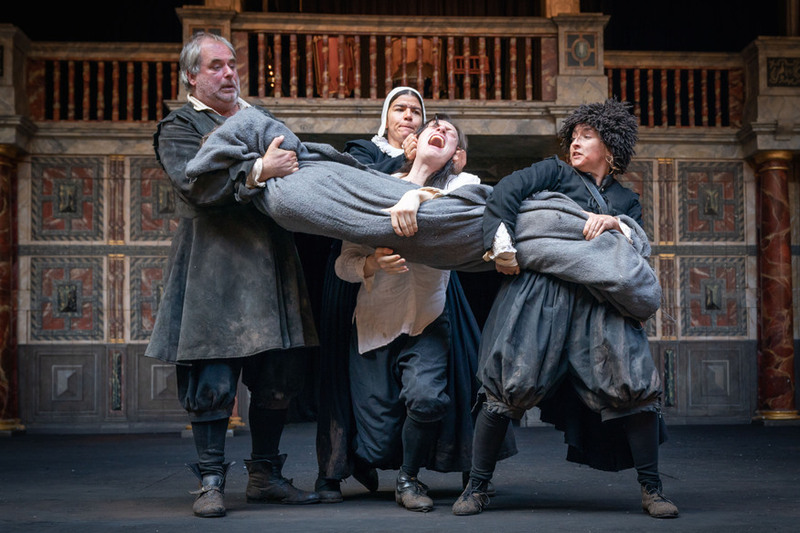 Despite being about the Plague, death doesn't actually hit the villagers until well over an hour and a half into the play, after which the cast drop like flies. The first act is dedicated to a detailed introduction to Eyam's residents: this lengthy preamble feels a little overdone, and I find myself, rather morbidly, wishing they'd hurry up and get to the bit where people die. That is, after all, why one sees a play about one of the worst tragedies in history. The characters dress universally in black. This, and the dark, brooding set — with its token ravens that grace the stage every few minutes — provide a solemn backdrop for the play, which takes place on the Globe's already atmospheric stage. This is enhanced by a soundtrack of rhythmic drumming that is occasionally accompanied by some flailing, almost tribal choreography, with varying degrees of success. Impressive performances from Norah Lopez-Holden, who plays the lovestruck Emmott, and Rose Wardlaw who plays Harriet, the black-toothed village crackpot mean that the women outdo the men on the acting front. Not one for the weak-stomached, Eyam is a gruesome, yet at times comical, venture into the 1600s.